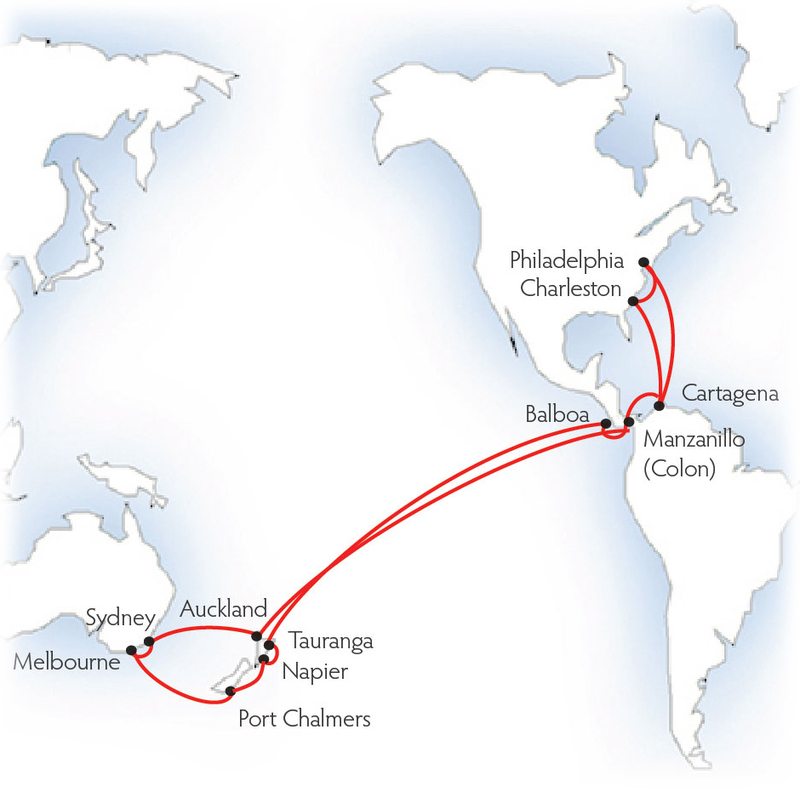 On the following voyages, vessels charters may expire soon. We could still secure some accommodations on the next departures. 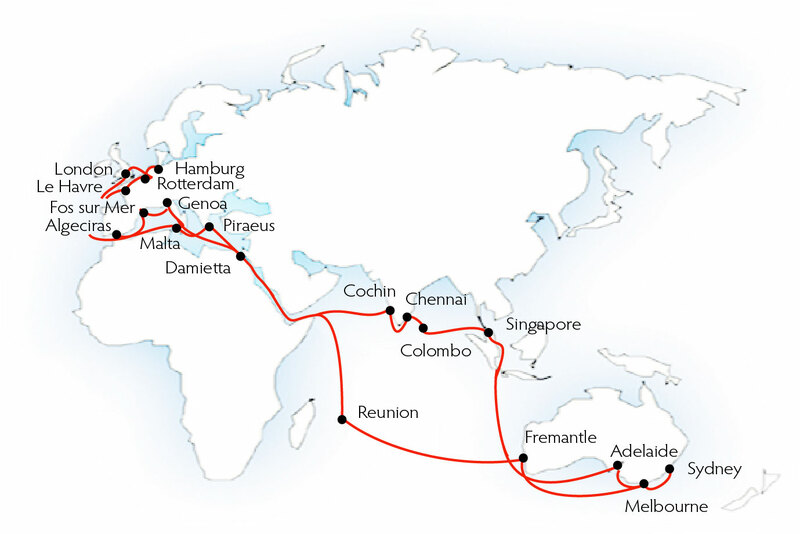 Sailing approx every three months: London (Gateway port), England (Day 1); Rotterdam, the Netherlands (2); Hamburg, Germany (Day 5); Le Havre, France (7); Fos sur Mer, France (13); Genoa, Italy (14); Damietta, Egypt (18); transit the Suez Canal (20); Pointe de Galets, Réunion (30); Fremantle (40), Melbourne (45), Sydney (48) and Adelaide, Australia (52); Singapore (63); Chennai, India (68); Colombo, Sri Lanka (71); Cochin, India (73); transit the Suez Canal (82); Damietta, 2nd call (83); Piraeus, Greece (86); Malta (88); Algeciras, Spain (92); London (97). Northbound voyage is available up to Singapore, only. 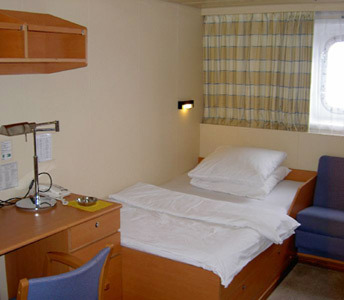 Two double bed suites (bed size 2.05 x 1.80 m), located on the Captain's (F) deck and facing forward, each having a total area of 30 sq. 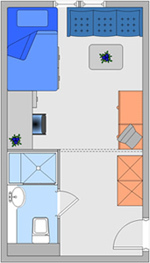 m. consisting of a bedroom, separate sitting room and private facilities with shower. - (Euro) €110 per person double, €125 single occupancy per day. A single cabin, located on the E deck and forward facing, consisting of a bedroom (bed size 2.05 x 1.25 m) with a sitting area and private facilities with shower, having a total area of approx. 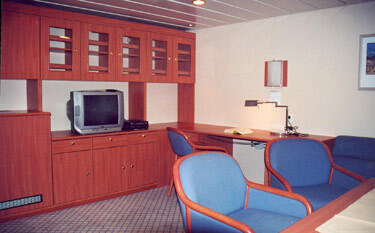 18 sqm - €105 per day. The Elisabeth S., 50,000-ton, 2009-built containership offers the Owner's twin-bedded suite and three smaller single cabins at (Euro) €95-€120 per person, per day. Sailing approx. every 10 weeks: Philadelphia, PA (Day 1); Charleston, SC (3); Cartagena, Colombia (8); transit the Panama Canal (9); Balboa, Panama (10); Tauranga, New Zealand (30) Sydney (34) and Melbourne, Australia (37); Port Chalmers (43), Napier (47), Auckland (48) and Tauranga, 2nd call (50) all in New Zealand, transit the Panama Canal (68); Manzanillo, Panama (69); Cartagena, 2nd call (71) and Philadelphia (77). The Nordpacific, 35,000-ton, 2018-built containership offers the Owner's double bed cabin at €115-€130 per person, per day. Sailing from Rotterdam, Netherlands, approx. 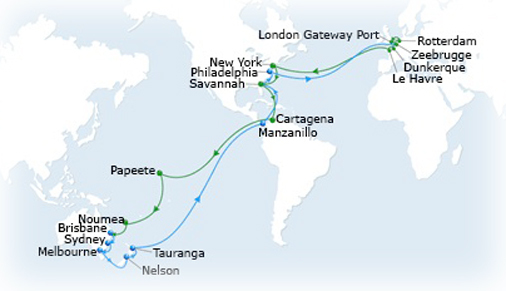 every three months, to London (Gateway terminal), UK (Day 1); Dunkirk (2) and Le Havre, France (3); New York, NY, Newark terminal (13) and Savannah, GA (16); Cartagena, Colombia (20); transit the Panama Canal (21); Papeete, Tahiti/French Polynesia (34); Noumea, New Caledonia (41); Brisbane (43), Sydney (46) and Melbourne, Australia (48); Nelson, (52) and Tauranga, New Zealand (55); transit the Panama Canal (55); Manzanillo, Panama (55); Savannah, 2nd call (77); Philadelphia, PA (79); Zeebrugge, Belgium (89) and Rotterdam (91). The International Maritime Organization (IMO) Low Sulphur Regulation requires all shipping companies to reduce the Sulphur emissions by 85%, and thereby reduce the environmental impact and significantly improve air quality. 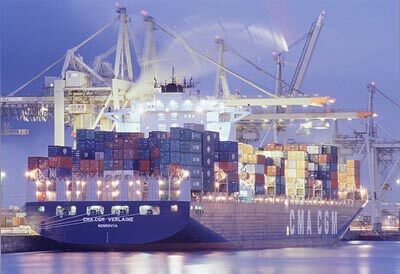 Accordingly, French line CMA CGM has recently signed two agreements with China State Shipbuilding Corporation (CSSC), in the presence of French president Emmanuel Macron and Chinese president Xi Jinping last month in Paris. 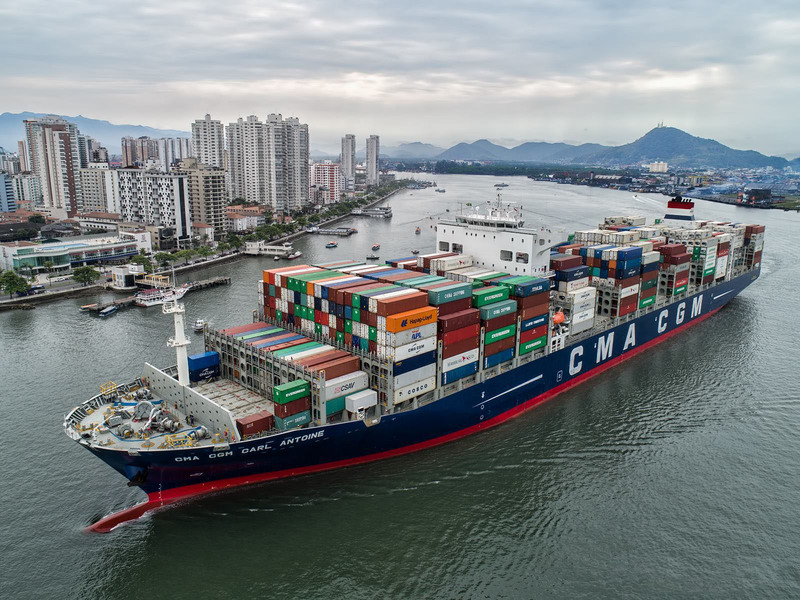 One agreement is for the order of 10 new 15,000 TEU (Twenty-foot Equivalent Units) containerships at CSSC, to be deployed in the Asia-Mediterranean trade route. Five ships will be fitted with LNG (Liquefied Natural Gas) propulsion, and the other five will use heavy oil as fuel, but will be fitted with hybrid scrubbers to clean the exhaust gas from the sulfur oxide (SOx), a major contributor to air pollution, and provide the highest level of energy efficiency. The two parties have also signed an agreement to continue to develop more efficient and environmentally-friendly vessels to reassert their leading role in the energy transition of the shipping industry.